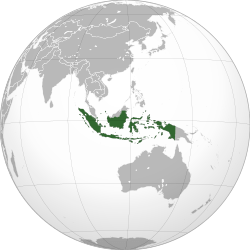 Indonesia ( i/ˌɪndəˈniːʒə/ or /ˌɪndoʊˈniːziə/), officially the Republic of Indonesia (Indonesian: Republik Indonesia), is a country inSoutheast Asia and Oceania. Indonesia is an archipelago comprising approximately 17,508 islands. It has 33 provinces with over 238 million people, and is the world’s fourth most populous country. Indonesia is a republic, with an elected legislature and president. The nation’s capital city is Jakarta. The country shares land borders with Papua New Guinea, East Timor, and Malaysia. Other neighboring countries include Singapore, Philippines, Australia, and the Indian territory of the Andaman and Nicobar Islands. Indonesia is a founding member of ASEAN and a member of the G-20 major economies. The Indonesian economy is the world’s seventeenth largest economy by nominal GDP and fifteenth largest by purchasing power parity. The Indonesian archipelago has been an important trade region since at least the 7th century, when Srivijaya and then later Majapahittraded with China and India. Local rulers gradually absorbed foreign cultural, religious and political models from the early centuries CE, andHindu and Buddhist kingdoms flourished. Indonesian history has been influenced by foreign powers drawn to its natural resources. Muslim traders brought Islam, and European powers brought Christianity and fought one another to monopolize trade in the Spice Islands of Malukuduring the Age of Discovery. Following three and a half centuries of Dutch colonialism, Indonesia secured its independence after World War II. Indonesia’s history has since been turbulent, with challenges posed by natural disasters, corruption, separatism, a democratization process, and periods of rapid economic change. Across its many islands, Indonesia consists of distinct ethnic, linguistic, and religious groups. The Javanese are the largest—and the politically dominant—ethnic group. Indonesia has developed a shared identity defined by a national language, ethnic diversity, religious pluralism within a majority Muslim population, and a history of colonialism and rebellion against it. Indonesia’s national motto, “Bhinneka Tunggal Ika” (“Unity in Diversity” literally, “many, yet one”), articulates the diversity that shapes the country. Despite its large population and densely populated regions, Indonesia has vast areas of wilderness that support the world’s second highest level of biodiversity. The country is richly endowed with natural resources, yet poverty remains widespread.